Woo-hoo! Got some good stuff today at the thrift store. At least, my boys consider it good stuff. I'm just glad to only pay 69 cents each for Star Wars weaponry. 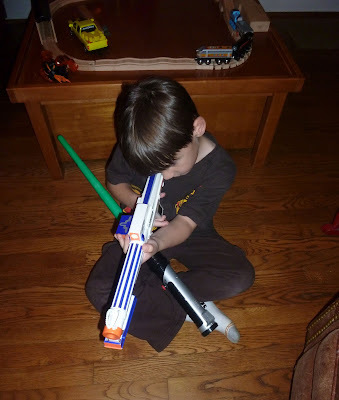 Now, we have a green light saber to battle with the blue one we have (My tip for sane play dates — have two of everything!). And the gun, well, that might be the first one I've ever bought him. I think some folks think we're anti-gun. Maybe because when Will was little, we didn't buy him guns. Not that that mattered. Little boys will make anything to a weapon (sticks, legos, Barbies) so I worked on these rules — we don't shoot at people or animals. Will is older now and at the age that running around the yard with buddies shooting each other is their favorite activity. Now my guidelines are yes, you can run around the yard shooting at each other IF all parties agree to the game. And if you get hurt in a light saber/sword fight, tough. We still don't let him randomly shoot at people/cars/animals. It's not polite and could be misunderstood leading to sticky situations. I found this discussion thread on the Berkeley Parents Network helpful. I practically squealed with delight when I found the vintage gem "I am a Kitten" (1970). And then another squeal for the "Best Story Book Ever" (not sure what printing but at least 70s). Me and the boys are huge Scarry fans! 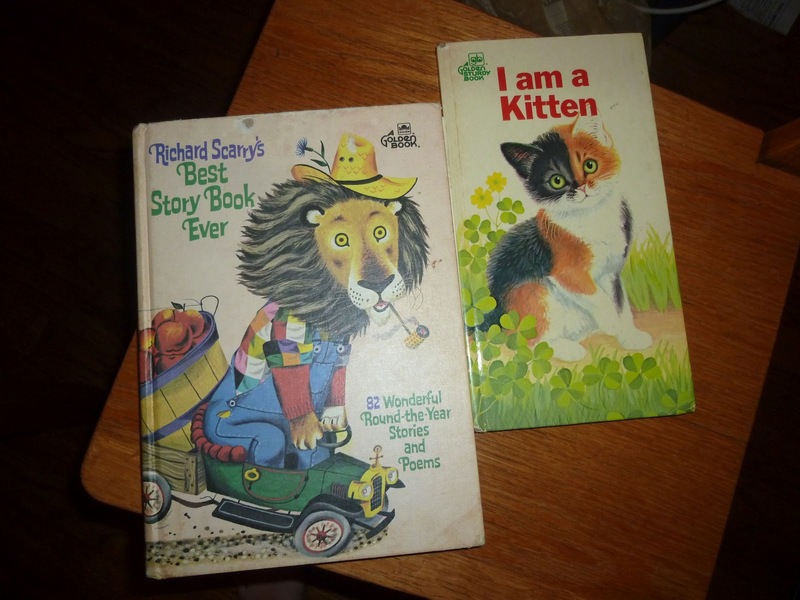 Both books were enjoyed at bedtime and will be read again and again. Also brought home: a Thomas the Train book for an upcoming birthday, the Dr. Seuss book "Please Try to Remember the First of Octember! ", "Amos & Boris" by William Steig, Walt Disney's "Stories from Other Lands" (1965), and Walt Disney's "Pinocchio" (1968 printing).